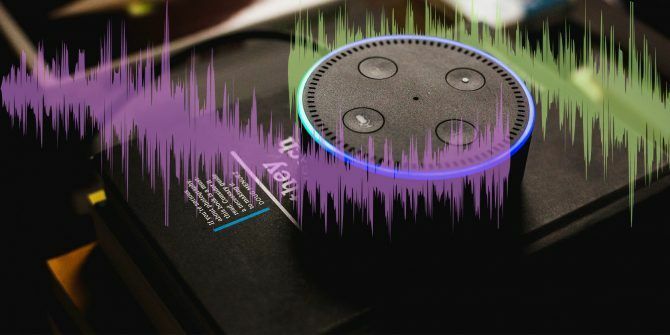 While the Amazon Echo has a ton of awesome skills 18 Awesome New Amazon Alexa Skills You Need to Try 18 Awesome New Amazon Alexa Skills You Need to Try The Amazon Echo's list of skills is growing all the time. Let's take a look at the most useful and silliest skills from the past few months. Read More , some of its simplest and most useful come packaged in. You probably ask Alexa about the weather almost every day, but do you ever wish it was a little better? By default, Alexa’s weather reading only gives information about your general area by ZIP code. If you’d like to hear weather for your exact location on an hour-by-hour basis, there’s an Echo skill that will help. 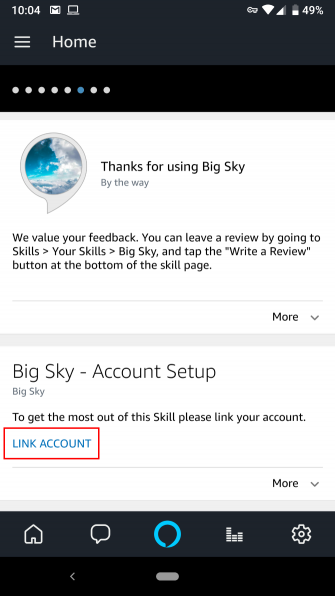 For a better weather experience, you need to use the BigSky skill. It’s powered by Dark Sky, a popular weather service on mobile 5 Useful Weather Apps That Are Fun to Check Every Day 5 Useful Weather Apps That Are Fun to Check Every Day These stylish and fresh weather apps make your daily weather updates that much more satisfying. Read More . This will help you get forecasts for your address instead of an entire city. To install it, either click Enable Skill on its desktop page, or say Alexa, enable Big Sky. Once you do so, you’ll need to link your account before it works properly. Open the Alexa app and look for the Big Sky—Account Setup card. Tap Link Account and enter your complete address. 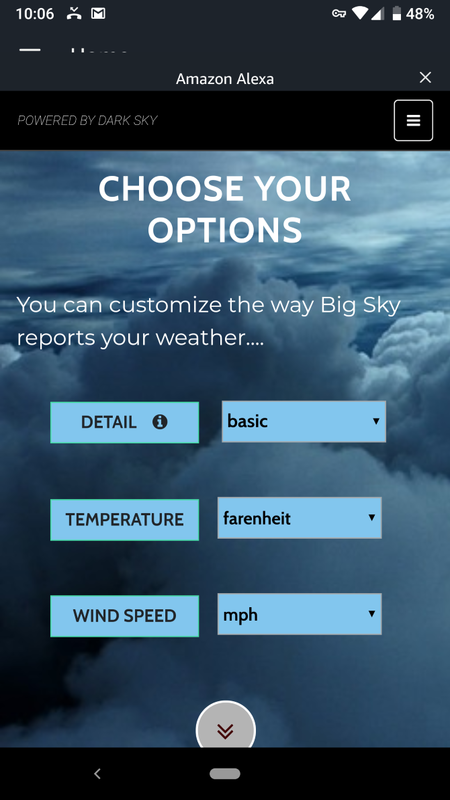 Below this, you can choose a few options like level of detail and temperature/wind speed units. Scroll to the bottom of the page and tap Submit to complete this. If this new skill inspired you, check out how to use Alexa to be more productive How to Use Amazon Echo and Alexa to Be More Productive How to Use Amazon Echo and Alexa to Be More Productive If you have an Amazon Echo, you have Alexa, the virtual and voice-activated personal assistant that can improve your productivity. Read More . 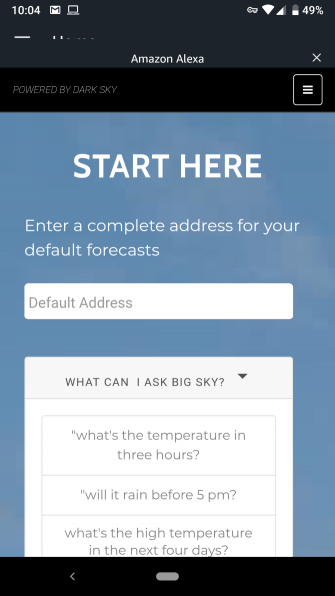 Explore more about: Alexa, Amazon Echo, Weather. What I really want, and I am shocked I can't yet get, is local radar on a Spot or a Show. I do like Big Sky. I'm already a fan. The developer is fairly responsive and as I recall, has posted on reddit about adding that as a feature some day.